Mayan Name: KAAN / Chiccan. Compatibility: Serpent, Water, Reed, Earth, Crocodile. 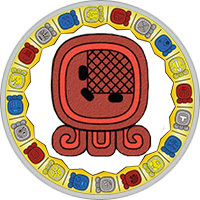 Mayan sign Serpent (Chiccan) is energy, a driving force, spiritual development. The meaning of the sign is the Milky Way. The patron deity is Kukulkan. For Maya Indians, the Serpent means the Divine or Supreme Vision. It was believed that the deity of the Heavenly Serpent, who knows how to take many forms, encircles the world: the upper face is directed to heaven, the lower one is the gateway to the underworld. In ancient hieroglyphs, a Serpent is often seen as a zigzag of lightning. It can be considered a symbol of energy, the force contained in the base of the human spine. Thus, the sign of the Serpent symbolizes the connection of man with the Higher Forces. The Serpent is a sign of magical power, it is believed that people of this day have unique abilities. Strong intuition helps them predict future events: how happy life will be, depends largely on the ability to correctly decipher their visions. The surrounding people perceive the representative of this sign as a calm person, but the appearance is deceptive. In it, a mighty force is slumbering, capable of awakening at the right time. He prefers not to waste energy on trifles, believes in his special purpose. Usually lives though a difficult, but eventful life. People of the Serpent sign are unpredictable natures: calmness instantly gives way to violent emotions. Such behavior is demonstrated not only by close people, but also by colleagues at work. Smart, hard-working people sometimes do not want to perform the simplest duties. Do not consider it necessary to engage in uninteresting business or just lazy. But they feel great in a creative environment, where there is no precise schedule, you can work on the mood, the main thing is a good result. Periods of labor activity can be replaced by months of downtime. This is the character of the man of this day: an organic combination of opposites. Emotional, passionate people of the Serpent sign completely relax in love relationships. They want to own the heart of the chosen one, who is surrounded with trembling care, with infinite attention. The person of this sign will never reconcile with a cold, indifferent attitude to his person, wants to experience the full range of emotions. He tries to build strong relationships, dreams of real feeling. Surrounded by numerous fans, the people of the Serpent sign do not attach serious importance to petty intrigues, their goal is a family union. For the sake of a loved one, they will easily sacrifice a career, they will refuse the most profitable business. The Serpent man is a dream, an unattainable ideal. A calm, strong-willed person evokes a sense of admiration, is always in the center of female attention. But do not think that it is easy to win his heart. He prefers to hide his real thoughts, devotes most of his time to work. He has strong physical health, he takes sports seriously enough. A spiritually developed man can give a lot to his partner, she should listen to his advice and recommendations. There is no doubt that he is a reliable and worthy companion of life. A bright, beautiful Serpent woman is perfectly aware of the power of her charms, if she wishes she can lead an idle way of life, not denying herself the pleasures. He has a lot of talents, he knows how to organize a profitable business. An industrious and intelligent woman can build a successful career. But does not tolerate loneliness, passionately wants to fall in love once and for all. A romantic, sensitive person wants to find personal happiness. Can leave work, forget about his hobbies for the sake of a beloved man. Probably, more than once will remind of the victim in the name of the family center, but it only a splash of emotions: the woman of the Serpent is created for marriage.